Uncommon, permanent resident found throughout most of the state, except in the northern North Coast area (Grinnell et al. 1937). Most abundant in drier open stages of most shrub, forest, and herbaceous habitats, with friable soils. Feeding: Badgers are carnivorous. They eat fossorial rodents: rats, mice, chipmunks, and especially ground squirrels and pocket gophers. Also eat some reptiles, insects, earthworms, eggs, birds, and carrion. Diet shifts seasonally and yearly in response to availability of prey. Cover: Badgers dig burrows in friable soil for cover. Frequently reuse old burrows, although some may dig a new den each night, especially in summer (Messick and Hornocker 1981). Reproduction: Young are born in burrows dug in relatively dry, often sandy, soil, usually in areas with sparse overstory cover. Pattern: Suitable habitat for badgers is characterized by herbaceous, shrub, and open stages of most habitats with dry, friable soils. Activity Patterns: Active yearlong. Nocturnal and diurnal. Variable periods of torpor in winter (Long 1973). Seasonal Movements/Migration: Non-migratory. Area used during winter smaller than at other seasons. Home Range: Home range estimates vary geographically and seasonally. In Utah, Lindzey (1978) found fall and winter home ranges of 5 females varied from 137-304 ha (338-751 ac). Those of 2 males varied from 537-627 ha (1327-1549 ac). In Idaho, Messick and Hornocker (1981) found that home ranges of 7 adult females and 3 males averaged 160 ha (400 ac) and 240 ha (600 ac), respectively. Territory: Little information available. Family members may share the territory of a female (Seton 1929). However, males generally are solitary, except in the breeding season (Messick and Hornocker 1981). Reproduction: Badgers mate in summer and early fall. Gestation period varies from 183-265 days, including delayed implantation. Embryo implants about 45 days prior to birth. An average litter of 2-3 (range = 2-5) born mostly in March and April (Long 1973). A few females may breed in first yr. Males not mature sexually until second yr. Badgers 11-15 yr. old have been reported (Flower 1931, Jackson 1961, Long 1973, Messick and Hornocker 1981). Niche: Badgers are highly specialized fossorial mustelids that help control small mammal populations. Somewhat tolerant of human activities, however predator control using indiscriminate trapping and persistent poisons causes extensive losses. Flower, S. S. 1931. Contributions to our knowledge of the duration of life in vertebrate animals. V. Mammals. Procs. Zool. Soc. London. 1931:145-234. Hall, E. R. 1946. Mammals of Nevada. Univ. California Press, Berkeley. 710pp. Jackson, H. H. T. 1961. Mammals of Wisconsin. Univ. Wisconsin Press, Madison. 504pp. Lindzey, F. G. 1978. Movement patterns of badgers in northwestern Utah. J. Wildl. Manage. 42:418-422. Long, C. A. 1973. Taxidea taxus. Mammal. Species. No. 26. 4pp. Messick, J. P., and M. G. Hornocker. 1981. Ecology of the badger in southwestern Idaho. Wildl. Monogr. No.76. 53pp. Newberry, D. W. 1973a. A contribution towards a bibliography of California furbearers. Calif. Dept. Fish and Game, Spec. Wildl. Invest., Sacramento. 148pp. Seton, E. T. 1929. Lives of game animals. 4 vols. Doubleday and Co., Garden City, NY. 3115pp. Seymour, G. 1968. Furbearers of California. Calif. Dep. Fish and Game, Sacramento. 55pp. Williams, D. F. 1986. Mammalian species of special concern in California. Calif. Dept. Fish and Game, Sacramento. Admin. Rep. 86-1. 112pp. Badgers are nocturnal, but have been seen active during the day as well. Badgers commonly feed on mice, woodrats, kangaroo rats, ground squirrels and pocket gophers. They also will eat fish, snakes and lizards. Badgers enlarge and dig out burrows in pursuit of prey. Badgers have been observed to plug accessory entrances to burrow systems, presumably to trap prey within the burrow. They also dig into a burrow from the "back entrance" and then lurk in the main entrance, capturing prey as it enters the burrow. 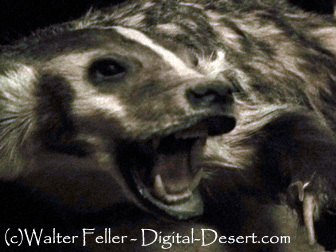 The badger is an aggressive animal and has few natural enemies. There are reports of predation on badgers by golden eagle, coyote, cougar, and bobcat. 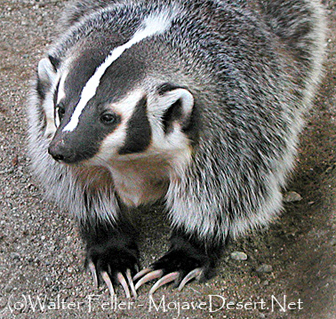 Wide open plains and deciduous woodlands are the principal habitats occupied by the American badger, but across its range a wide variety of habitats are utilized, and the species can also be found in mountainous areas marshy areas, prairies and deserts.